Swiping over a message header will do exactly the same as in the phonebook - a left swipe starts a new message, while swiping to the right will start a call. Moving on to email, the Gmail app supports batch operations, which allows multiple emails to be archived, labeled or deleted. Multiple Gmail accounts are supported. Switching between accounts is pretty easy. The top row holds two labels - the first is the name of the inbox you're currently viewing (tap to change the inbox) and the one next to it is the name of the current folder (again, tap to change it). The Galaxy Note sports a combined inbox, which brings together all your mail in a single folder. This can be quite handy if you have lots of accounts and you just want to check if there is a new message needing your attention. Turning the phone landscape activates the split view - the left side of the screen shows the list of emails, while the right side shows a message. This feature is present on the Galaxy S II as well, but it makes much more sense here as only a screen as large as this allows you to read comfortably by only using two thirds of it. The Galaxy Note I717 gives you a whopping three options for text entry. You have the standard Samsung keyboard, which now (unsurprisingly) utilizes the S Pen for handwriting as well. In case it doesn't cut it for you, there is the plain vanilla Android keyboard, as well as Swype at your disposal. 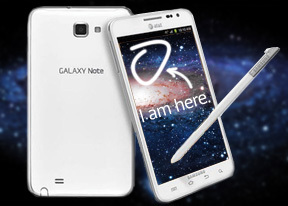 The Samsung Galaxy Note I717 uses the standard Android gallery. The gallery automatically locates the images and videos no matter where they are stored. It even imports the online photos from your Google Picasa web albums. Little about the Gallery should surprise you - aside from displaying full-res images and the addition of the two-finger tilt zoom, there's nothing new really. And don't you worry, the double tap and pinch zoom are still there. Sharing your images over just about anything is a couple of clicks away. If you have setup social network accounts you can also post your images straight from here. The My Files app is a simple to use but functional file manager. It can move, copy, lock and rename files in bulk, even send multiple files via Bluetooth. My files will only browse the memory card and the large internal storage (it can't access the system drive).